There has always been something appealing about JVC's "D-ILA" technology, which is their proprietary version of LCOS. On JVC's projectors, pixelation is virtually invisible, and they have always had a unique filmlike quality that surpasses that of LCD and DLP. Moreover, color precision on JVC projectors is always outstanding. But they have never captured much share of the home theater market due to features that were somewhat problematic-lower than average contrast, higher than average fan noise, unstylish casework design, high prices and expensive lamp replacements. With the new JVC DLA-RS1, the truth has changed. In this one dramatic product release, JVC has swept all of these previous problems away. The RS1 is a 1080p resolution, D-ILA-based projector with extremely high contrast, very low fan noise, and the same pixel-free image with virtually perfect color processing we are used to seeing from JVC, all for a supremely competitive price of $6,295. 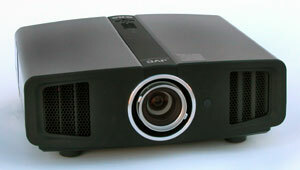 The DLA-RS1 is without a doubt the finest projector JVC has ever made for the consumer marketplace. Light Engine: 1920x1080, native 16:9, 0.7" three-chip D-ILA (LCoS), with a 200W UHP lamp. Connection Panel: Two HDMI ports, one set of YPbPr Component inputs, one s-video port, one composite video port, one RS-232C port for service and remote control. Lens and Throw Distance: 2.0:1 manual zoom/focus lens with manual H/V lens shift. Throws a 100" diagonal 16:9 image from 10' to 20'. Warranty: Two years (90 days on the lamp).